The weekly seismic data for this Update Report has yet to arrive, but I should have access to that information this evening. Right now Earth is at the 90-degree right triangle position relative to the Sun and Black Star marking the time that our planet sees minimum values for earthquake events across the board. To give you some indication of where we are at the end of this 2015 Earth Orbit Cycle, I have included the quake data for last week above with the asterisk (*) showing almost-identical values. I will update the information for this week and re-upload the newsletter once New sends me the information hopefully later this afternoon/evening. The 2.5 to 4-magnitude earthquake events should continue the gradual decline to sub-200 event levels for Week 54 that ends the current earth change lull period to begin the 2016 Earth Orbit Cycle relative to the inbound Black Star. Earth is in position right now to turn around in natural orbit of the Sun to begin moving towards the Libra Constellation, but we continue to move within the predicted transition period and the Black Star/Earth magnetic portal connection is preparing to shorten rapidly once our planet has sufficient time to make the critical move through this area of space on the winter orbit side of our solar system from the northern hemisphere perspective. .... Project heroes for this week include James, Solar Rayes and Tex who subscribed to Terral’s 2016 Newsletter using the Subscription Button at http://terral03.com. Roger, Edward, John and Maureen renewed their subscriptions from previous years making them longtime supporters of the research. Randi and Wesley made donations to the research. Many thanks to everyone supporting the research for making the investigation possible. See the Full Report in Terral's 2016 Newsletter Volume 5. Rescue workers are currently trying to pull people from the wreckage (right) after at least four buildings collapsed in the city of Tainan following the quake, which struck shortly before 4am. 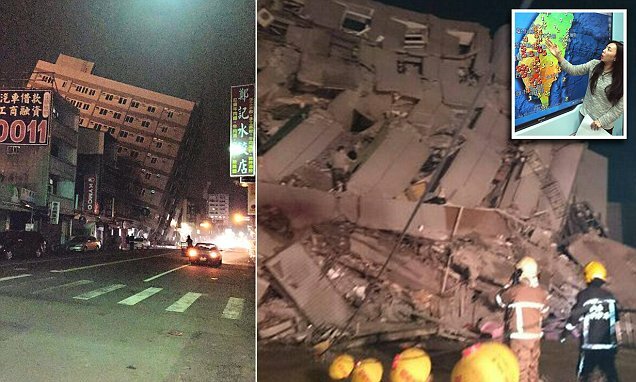 Pictures circulating on social media show the multi-storey buildings leaning precariously (left), or seemingly completely destroyed by the quake, which was very shallow, amplifying its effects. Indonesia issued a tsunami warning on Wednesday after a massive and shallow earthquake struck off the west coast of the island of Sumatra, an area hit badly by the 2004 Indian Ocean quake and tsunami. The warning was issued for West Sumatra, North Sumatra and Aceh after the quake of magnitude 7.9 upgraded to 8.2, the National Meteorological Agency said. The epicentre was 808 km (502 miles) southwest of Padang, the U.S. Geological Survey said. It was 10 km (six miles) deep. The earthquake was centered just southeast of Kumamoto. It struck about at a shallow depth of 10 kilometers. A tsunami advisory has been issued for coastal areas. Kumamoto is the capital city of Kumamoto Prefecture on the island of Kyushu, Japan. State broadcaster NHK reports that a tsunami advisory is for possible wave of 1 metre in height. Less than 30 minutes after the initial quake, at least two M5.8 and M5.7 aftershocks has been reported. A series of large earthquake has occurred (and is still occurring) in South Japan. The earthquakes so far topped out at M7.1, with swarms of M5.0 to M6.0 range “aftershocks” spreading out across the region to nearby adjacent volcanic locations. Make note of the “line” or progression of earthquakes which shows over the past three days since the original M6.5 earthquake struck. The movement began at the Southwest tip of the island, and has progressed Northeast, striking multiple volcanoes along the way (as seen in this graphic below). During this widespread swarm of large earthquakes, Mount Aso (located towards the center of all the activity) sent off a new blast. Japanese news covered the eruption at the nearby volcano, but most international media outlets are lagging behind by at least a day in reporting events. It is troubling to see that the whole series of earthquakes kicked off with a M6.5 near a long dormant Volcano named Kumano-Dake, then spreading Northeast to Mount Aso Volcano, then spreading further Northeast to Yufu-Tsurumi Volcano. The spreading of earthquakes to adjacent areas was something we were watching for. A strong earthquake of magnitude 7.8 struck off the coast of Ecuador late on Saturday, killing at least 28 people. The shockwaves sent confused residents streaming into the streets of the capital Quito. A tsunami warning has also been issued for local coasts. 'Based on the preliminary earthquake parameters, hazardous tsunami waves are possible for coasts located within 300 kilometres of the earthquake epicenter,' the Pacific Tsunami Warning Center said. April 17 (Reuters) - A strong magnitude 7.4 earthquake struck off the coast of Ecuador late on Saturday, the Pacific Tsunami Warning Center said, creating the possibility of dangerous waves along the coasts of Ecuador and Colombia. The quake was centred just off the coast of Ecuador at a shallow depth of 10 km (6 miles), 107 miles (173 km) west northwest of its capital, Quito. BREAKING: 28 Dead Ecuador "Mega Mega 7.8 Quake"
Sunday’s devastating earthquake in Ecuador might just be the beginning, according to a seismologist who says that current conditions in the Pacific Rim could trigger at least four quakes with magnitudes greater than 8.0. A total of 38 volcanoes are currently erupting around the world, making conditions ripe for seismic activity in the Pacific area. More than 270 people are now confirmed dead after Sunday’s quake in Ecuador, with the number expected to rise. In Japan, at least 42 people have been killed after tremors measuring 6.5 and 7.3 struck the southwest part of the country in the past week. A quarter of a million people were ordered to leave their homes amid fears of aftershocks. Five years on from Japan’s devastating earthquake and subsequent tsunami, the country fears a repeat of the disaster which left more than 15,000 people dead. Scientists at Tokyo University estimate there is a 98 percent chance that, in the next 30 years, Japan will be hit by an earthquake equivalent to the “Great Kanto” of 1923, which measured 8.9 and killed an estimated 142,800 people. Seismologists at the Japan Meteorological Agency, however, put the odds of this happening at 70 percent. Japan has some of the world’s strictest building codes due to the amount of seismic activity in the area, with Tokyo getting rocked at least once a month. Buildings may be able to withstand an earthquake, but as the 2011 quake proved, the ensuing tsunami can cause more damage including the nuclear fallout at Fukushima. In the Himalayan region where 8,000 people were killed a year ago when a quake measuring 8.0 hit Nepal, India’s disaster management experts from the Ministry of Home Affairs warned in January that another quake of that size was long overdue in the region. Tectonic plates west of the Nepal epicenter remain locked together with scientists fearing the accumulation of stress will soon reach its elastic limit. Greenpeace brought noted geologist Professor Dr. Roger Bilham of the University of Colarado, who has published a paper in Current Science, a reputed science journal, on earthquake risk in Jaitapur. His paper indicates that a high magnitude earthquake cannot be ruled out in Jaitapur. Here he explains why. While briefing the audience, Dr. Bilham said, "Since Jaitapur lies in the same compressional stress regime that has been responsible for generating both the Mw=6.3 Latur and the Mw=6.4 Koyna earthquakes in the past five decades it can be argued that a similar sized could possibly occur directly beneath the power plant. The probability of this earthquake occurring is low but it is nevertheless possible, and is an important consideration in the design of a safe power plant." He added that it was not possible to confidently say that an earthquake of a high magnitude would not occur in Jaitpur as one needs to examine reliable data spanning many centuries in order to do so. This is due to the long gaps between earthquakes. With regard to Jaitapur, the available data that can be relied upon only extends to last 200 years -- a small time in geological history". The Jaitapur area comes under Ratnagiri district which falls in the seismic zone 4 (High damage) category with zone 5 being the highest (2). The area has witnessed 92 earthquakes within 1985 to 2005 (3). This is a recording of a press conference held at the press club in Mumbai on the 12th of Jan.
"water has a lot of weight. 1cubic meter is equal to more than 2 tons for instance (gives you an idea of the pressure of the Ocean on the Crust) This implies that the more water are added in certain locations the more that pressure on the underground will increase in proportion. Our Crust is relatively balanced in its movement due to Tectonic. However if more are added in places where it was not the case before you change the primary condition and create a serious unbalance in that location. Suddenly a location which was in balanced condition for years, centuries or millenia, sees its balanced totally modified. For a while it will be unnoticed since the Crust is able to absorb a lot of pressure. But that ability as its limits as well. The ground can be fractured here and there for years without people knowing it. Those fractures find themselves in a new condition in which they can now move, and the culprit here is infiltration of water under pressure. That water can be pushed through because of the pressure and lubricate the rocks around thus giving them more facility to move Like oil lubricating pistons in a car. This had been observed many years ago after the construction of a new dam in the US. When they let the Reservoir Lake fill itself, seismic activity (small of course) increased in the surrounding location. They discovered that the weight of the water in the Reservoir push the water into the micro-fracture in the underground, lubricating them and giving the ability to slide against each other thus creating some seismic activity. Enough to show that under pressure, water can serve the same purpose as oil in the rock and make things more slippery, thus easier to slide against each other, thus creating ground movement... Now, take this and multiply the same effect on a planetary scale and you have an idea of what can be coming with the increase of water falling from the skies through typhoon, hurricanes, storm of every kind, etc, or even the increase of water level in the Oceans... Third. As a side note, did you saw the recent activity reported by the USGS? If you go on their interactive map and ask to show the quakes above 4.5M from the last 30 days you will see something quite disturbing about the US West Coast. Nearly ALL the seismic activity is on the Asian side or the South American region. In the US Coast there is nearly NOTHING... that should scare the sh.t out of us because it means pressure is increasing underneath... But the last quake in Ecuador could increase that pressure even more and lead to a future rupture triggering the long awaited so-called "Big One" in California. " April 2016 – GEOLOGY – A series of powerful earthquakes which struck Asia and South America in the past week could be followed by a ‘mega’ quake in the near future, a scientist has claimed. On Thursday and yesterday, two earthquakes struck Japan, killing at least 41 people, causing landslides and widespread damage to buildings and infrastructure. Today, a 6.1 magnitude quake struck southeast of the Pacific island nation of Tonga, with no immediate reports of damage. ‘And if they delay, the strain accumulated during the centuries provokes more catastrophic mega earthquakes.’ In addition to the four major earthquakes to have struck since Thursday, last week there were also shakes in the Philippines, Vanuatu and Myanmar. All of the earthquakes have occurred in countries straddling the so-called Ring of Fire. This is a horseshoe-shaped series of trenches spanning the Pacific Ocean where tectonic plates are shifting and seismic and volcanic activity is common. The U.S. Geological Survey, an independent agency which monitors natural hazards such as earthquakes, says ‘mega’ earthquakes are rare, but not impossible. It says there is no fault line – the areas where shifting plates that make up the earth’s crusts meet – is known which is capable of generating a magnitude 10 earthquake. However, scientists cannot completely discount a ‘mega’ earthquake because they’ve only been measuring seismic activity for the past 100 years. Meanwhile, Japanese rescue teams were today scouring the splintered remains of buildings destroyed by the shakes as time ran out for finding survivors. Why is the planet being struck by so many large earthquakes? According to the USGS, the number of large magnitude earthquakes striking the planet doubled in 2014. The USGS is quite certain about the data but it is uncertain about the cause. April 2016 – GEOLOGY – Seismic tension continues to mount in the volatile region of the planet known as the Ring of Fire, where more than 90% of the world’s earthquakes occur, and more than 81% of the largest magnitude earthquakes occur. The extraordinary and precipitous rise in the number of large magnitude earthquakes is both astounding and alarming. On average, only about fifteen 7+ magnitude earthquakes strike the planet each year. We’ve had 2 such earthquake in less than 72 hours. This has continued to baffle many of the world’s leading geologists, who still attest the rise in the number of large earthquakes is merely a random natural occurrence. For instance, the number of large earthquakes doubled in 2014. However, here’s what scientists had to say about it: “If you think there have been more earthquakes than usual this year, you’re right. A new study finds there were more than twice as many big earthquakes in the first quarter of 2014 as compared with the average since 1979. The average rate of big earthquakes — those larger than magnitude 7 — has been 10 per year since 1979, the study reports. That rate rose to 12.5 per year starting in 1992, and then jumped to 16.7 per year starting in 2010 — a 65 percent increase compared to the rate since 1979. This increase accelerated in the first three months of 2014 to more than double the average since 1979, the researchers went on to report. Why is our planet having so many big earthquakes? It’s because big geological processes are driving the reactive seismic forces that create earthquakes along faults, trenches, and the planet’s many subduction zones. We don’t live on a perfect sphere. We live on a planet that more resembles a cracked egg. Cracked and badly fractured, partially due to its geology but mainly due to the intense heat rumbling within its interior (about 6,000 C and 10,800 F) and the geological dissipative features that try to regulate that heat and resulting kinetic energy. These geologic features include mantle plumes, faults, tectonic plates, submarine vents, and volcanic systems. – where will the next big quake strike? 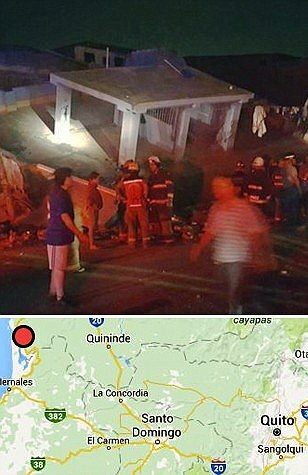 April 2016 – ECUADOR – A 7.8-magnitude earthquake struck on Ecuador’s coast Saturday, leaving at least 246 people dead and 1,500 wounded after causing buildings to shake in cities more than 100 miles away and collapsing an overpass, authorities and witnesses said. The Ecuadorian earthquake was 6 times stronger than the 7+ magnitude earthquake that recently struck the southern island of Japan. The temblor struck just before 7 p.m. local time (8 p.m. ET) with an epicenter 16 miles south-southeast of the coastal town of Muisne, located on the country’s northwestern coast, the U.S. National Geological Survey said. The quake was recorded at a depth of about 12 miles. Ecuador’s Vice President Jorge Glas said 28 people were killed according to initial information. “Based on preliminary information, there are 16 people dead in the city of Portoviejo, 10 in Manta and two in the province of Guayas,” Glas in a televised address. “We continue to receive information.” The country’s Geophysics Institute in a bulletin described “considerable damage” in the area of the epicenter and in Guayaquil. President Rafael Correa said states of emergency were declared for the provinces of Esmeraldas, Los Rios, Manabi, Santa Elena, Guayas and Santo Domingo. The quake was strongly felt in country’s capital of Quito, around 100 miles away. “I was in my house watching a movie and everything started to shake. I ran out into the street and now I don’t know what’s going to happen,” Lorena Cazares, 36, a telecommunications worker in Quito, told Reuters. A local Ecuadorian television station reported that houses collapsed in Esmeraldas, the province where Muisne is located, and power outages. A car was seen crushed after an overpass collapsed in the country’s largest city, Guayaquil, located 200 miles to to the south. April 2016 – JAPAN – The wooden home barely withstood the first earthquake. An even stronger one the next night dealt what might have been the final blow – if not to the house, then to the Tanaka family’s peace of mind. The Tanakas joined about 50 other residents of the southern Japanese town of Ozu who were planning to sleep in their cars at a public park Saturday after two nights of increasingly terrifying earthquakes that have killed 41 people and injured about 1,500, flattened houses and triggered major landslides. “I don’t think we can go back there. Our life is in limbo,” said 62-year-old Yoshiaki Tanaka, as other evacuees served rice balls for dinner. He, his wife and his 85-year-old mother fled their home after a magnitude-7.3earthquake struck Saturday at 1:25 a.m., just 28 hours after a magnitude-6.5 quake hit the same area. Army troops and other rescuers, using military helicopters to reach some stranded at a mountain resort, rushed Saturday to try to reach scores of trapped residents in hard-hit communities near Kumamoto, a city of 740,000 on the southwestern island of Kyushu. Heavy rain started falling Saturday night, threatening to complicate the relief operation and set off more mudslides. “Daytime today is the big test” for rescue efforts, Japanese Prime Minister Shinzo Abe said early Saturday. Landslides had already cut off roads and destroyed bridges, slowing down rescuers. Nearly 200,000 homes were without electricity, Japanese media reported, and an estimated 400,000 households were without running water. Kumamoto prefectural official Riho Tajima said that more than 200 houses and other buildings had been either destroyed or damaged, and that 91,000 people had evacuated from their homes. Hundreds of people lined up for rations at distribution points before nightfall, bracing for the rain and strong winds that were expected. Local stores quickly ran out of stock and shuttered their doors, and people said they were worried about running out of food. Police in Kumamoto prefecture said that at least 32 people had died from Saturday morning’s earthquake. Nine died in the quake on Thursday night. More than half the deaths were in Mashiki, a town on the eastern border of Kumamoto city that was hit hardest by the first quake. An unexplained carpet of foamy bubbles filled streets in the centre of the southern Japanese city of Fukuoka in the early hours of Saturday morning – shortly after tremors from a devastating earthquake of magnitude 7.3shook the town. Twitter users posted pictures of the mysterious foam, with one calling it “disgusting. I saw it just after the earthquake,” said Kazuki Nabeta, who lives in the busy central district of Tenjin, where the bubbles were found. Some have speculated that the earthquake may have caused an underground pipe to burst. April 2016 – ARIZONA – Arizona is experiencing an unusual earthquake swarm in the northwest part of the state. Nearly two dozen small earthquakes have hit in 10 days. They’re happening in a remote northwest part of Arizona. Some of the quakes are so small, you’d never even feel them. “There is always a small chance that these are foreshocks and something larger could happen, but that’s only usually a few percent of the time,”said Lee Allison, sirector of the Arizona Geological Survey. The shaking may be light, but state geologist Allison says this kind of “earthquake swarm” hasn’t happened here in at least a decade. “We don’t know right now, is this swarm of earthquakes something that is very unusual and hasn’t happened before or do we see these things and we just haven’t been able to record them and we didn’t know they were going on?” said Allison. Allison says this shaking is happening on a small fault, about 10 miles long, adding that usually determines how big the quakes can get. “At this point, we’re not anticipating anything larger, much larger than the earthquakes we’ve already seen,” said Allison. The earthquake swarm, though, is allowing scientists to start projecting out, to get an idea of how big an earthquake might occur in that region. “We don’t have as many active faults as California, but we have seen historically earthquakes as large as 6.5 occurring within the state,” said Allison. April 2016 – GUATEMALA – A 6.2 magnitude earthquake that hit off the coast of Guatemala Friday morning was not expected to create a tsunami, according to experts. The large quake hit at about 7:30 a.m. PDT and was centered about 60 miles off the coast of the Central American country. Why is the crust of the Earth shaking so violently all of a sudden? Over the past 48 hours, there have been five major earthquakes globally, and one prominent seismologist has declared that “catastrophic mega earthquakes” could be on the way. In fact, seismologist Roger Bilham of the University of Colorado has made headlines all over the world by warning that “current conditions might trigger at least four earthquakes greater than 8.0 in magnitude”. If his projections are accurate, our planet could be on the precipice of a wave of natural disasters unlike anything that any of us have ever experienced before. April 2016 – INDIA – A subduction process similar to the one that caused the Ecuadorean quake is happening under the Himalayan region as well, where the Indian plate is getting inside the Chinese landmass. This northward push has been creating a huge amount of tectonic strain in the region, making it particularly prone to earthquakes. “We know there is a huge amount of accumulated strain in this area. It is due for a major earthquake, perhaps a series of earthquakes, bigger than 8 on the Richter scale. That is the kind of energy that is estimated to be accumulated there. This was certainly not one of those earthquakes that is probably imminent.